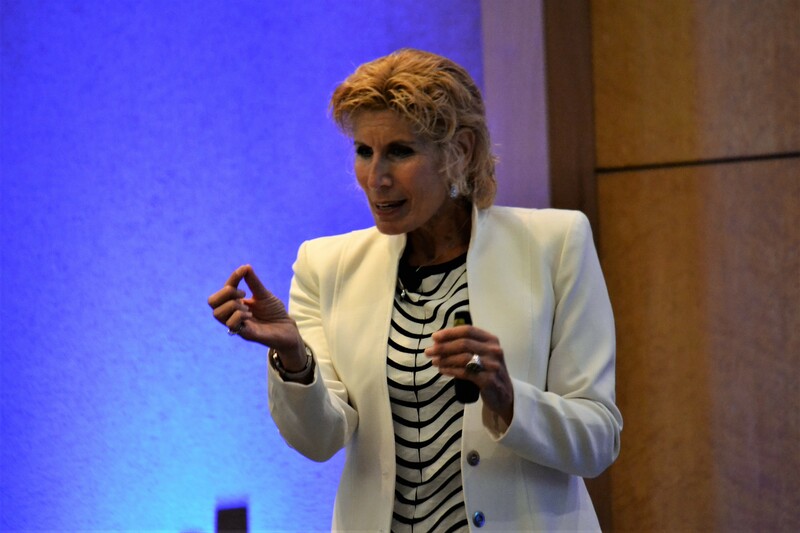 Bonnie Low-Kramen is recognized as one of the world’s most respected and inspirational thought leaders in the administrative profession. 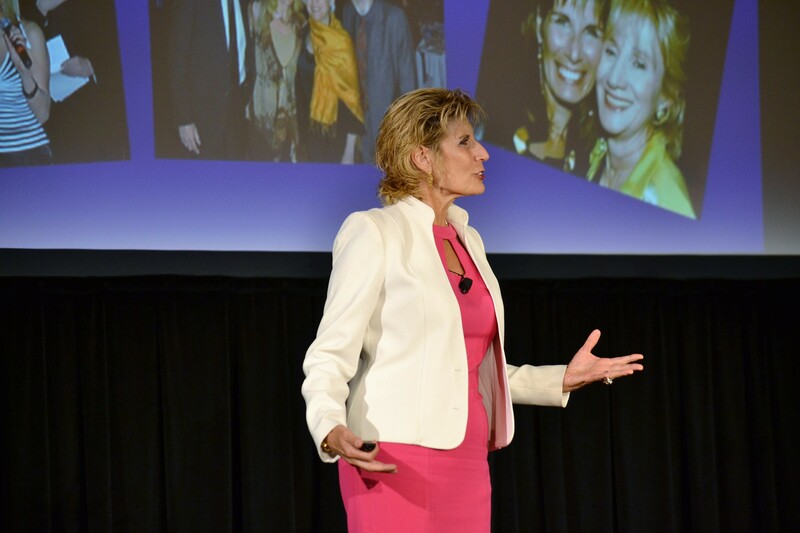 In 2018 , Bonnie’s Be the Ultimate Assistant workshop (that is co-taught with Vickie Sokol Evans) was named as one of the “Top 7 Conferences to Attend in 2019” and she received the Impact Award for Lifetime Achievement from the Boston Executive Assistants Organization and in 2015 she was named Educator of the Year by the Domestic Estate Managers Association. She worked as the Personal Assistant to Oscar-winning actress Olympia Dukakis for 25 years until 2011. Bonnie’s passion is to affect positive change in the global workplace by paving the way towards healthy and productive relationships between assistants, leaders, and fellow staff. A committed advocate for women’s issues, Bonnie is at the center of the efforts to close the wage gap between women and men and to ending workplace bullying. 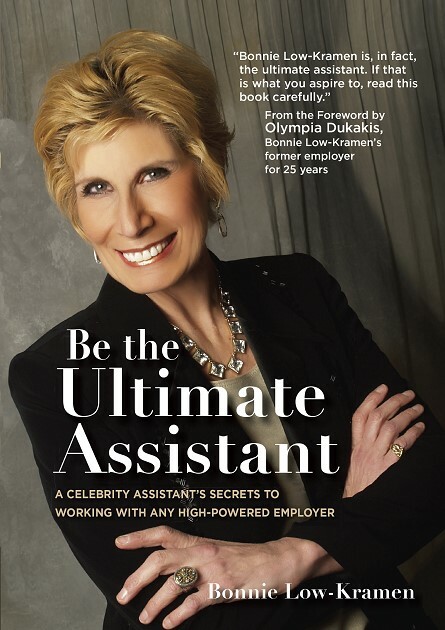 Bonnie is the bestselling author of the desk-side resource book “Be the Ultimate Assistant, A celebrity assistant’s secrets to working with any high-powered employer.” She is a sought-after opening keynote speaker and trainer at conferences and corporations around the world. The training modules can be customized to the specific needs of your team and designed to support the goals of an assistant’s Career Development Plan (CDP.) The best results are experienced through frequent and varied learning opportunities each year. 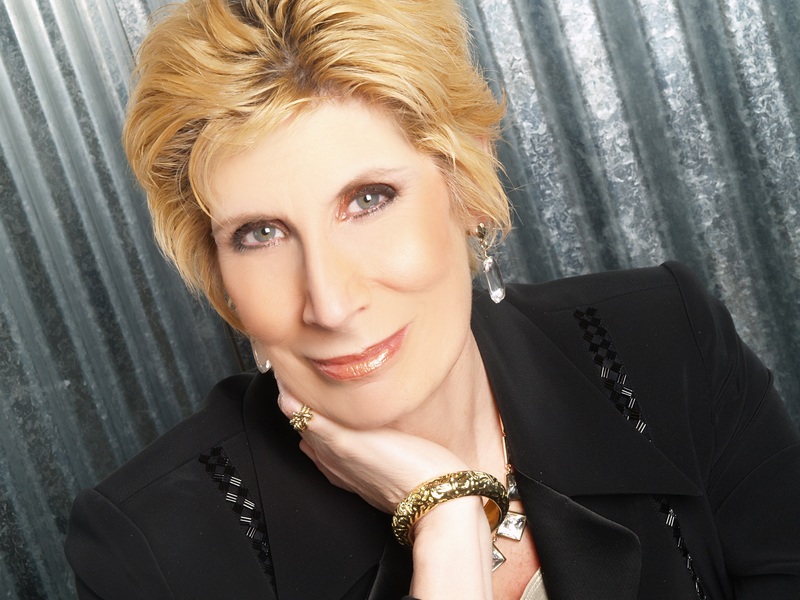 As a former assistant to a world famous actress for 25 years, Bonnie Low-Kramen has instant credibility with staff and executives at every level. Her unique ability to connect in powerful and authentic ways enables her to get to the heart of the matter –fast. We’re all busy and have no time to waste in our 24/7 environment. Bonnie gets it and has the answers your team needs now. Education is transformational. With real-life tools and strategies, we inspire and motivate assistants to strive for excellence and to go above and beyond –not just on some days, but every day. When the inevitable problems arise, they will know exactly what to do and address them easily and with minimal angst. Duration for each module can range from 30 minutes up to a full day. – Find Your Voice to Speak Up! As the backbone of companies and the right arms to their managers, it is increasingly necessary for assistants to step up as leaders within their roles. This highly interactive workshop is designed to develop and fine-tune the mindset, confidence, and give you the tools needed to succeed as a strategic business partner. It will focus on the soft skills necessary to excel as an assistant including communication techniques and problem-solving strategies. Students will learn practical ideas on how to excel as an assistant and how to make the most out of their relationship with managers and fellow staff. When assistants are empowered to take the lead in collaboration with their managers and within their roles, the potential for increased productivity and professional growth is limitless. This workshop will focus on the ways to leverage these powerful relationships, resulting in a renewed commitment to excellence in communication and superior customer service. PowerPoint, real-life stories, interactive group exercises and video support and illustrate all of the above. Assistants can be a manager’s most powerful secret weapon. That’s why bringing both groups together for an interactive session has high positive impact. Managers will learn how to maximize effectiveness, productivity, and profitability by fully utilizing their assistant. Assistants will gain insights about taking their work to the next level for the benefit of their manager(s), themselves, and the company they represent. Designed to build mutual respect and empathy, the goal of this training is to learn immediately actionable strategies to empower managers and assistants –for now and the future. Real-life stories, interactive group exercises and video support and illustrate all of the above. Find Your Voice to Speak Up! Many assistants (and managers too) find speaking up to be a difficult and often impossible assignment. Why? Fears sidetrack and stop us from fulfilling what we know instinctively could change our world. But, how? Bonnie walked this road as the Personal Assistant to Oscar-winning actress Olympia Dukakis for 25 years. She will share “been there, done that” work/life experiences to provide real-life tools to conquer your own fears about speaking up. What is at stake is nothing less than your own professional and personal growth. 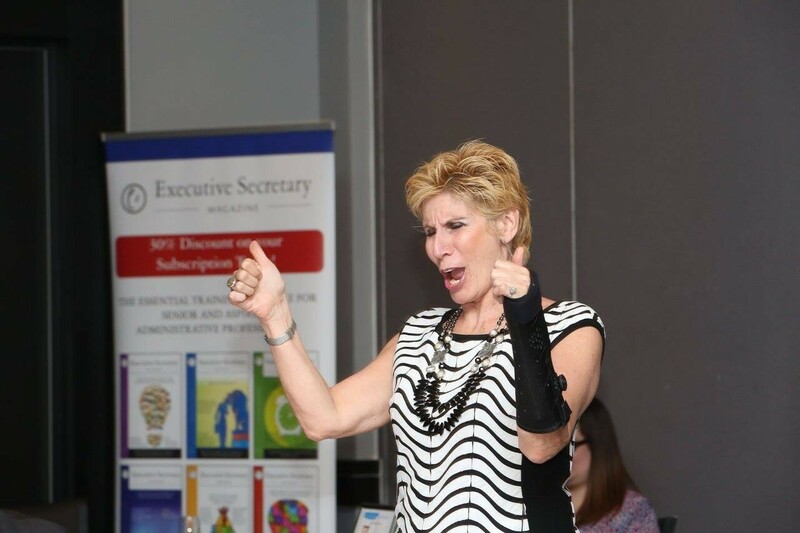 Bonnie believes that finding your voice is the number one challenge facing assistants and she is ready to tackle it with you. Are you game? Everyone knows that excellent communication is critical to success in today’s workplace. However, because we are operating on so many channels verbally, non-verbally, and in writing, it is no surprise that there is confusion and miscommunication. The subtle breakdowns of communication can make or break an assistant and can explain why workplace relationships succeed or fail. The ability to find the words to say what you mean and mean what you say is a challenge for too many. In this session, we will explore ways to make it easier and even fun. This module builds confidence, self-esteem, and public speaking skills.Each student prepares a two-minute timed lesson to teach to the rest of the class. It is a work-related story. For this exercise, students choose to sit or stand, read it from written notes, cell, tablet, PowerPoint slides or memorize it. DiSC is a personal assessment tool used to improve work productivity, teamwork, and communication. DiSC is non-judgmental and helps people discuss their behavioral differences specific to the workplace. Minutes after taking the test, students receive an electronic 24-page report/analysis of their workplace personality. The DiSC has proven to be an extremely useful tool for assistants as it offers insight to their own personality as well as those of others. If an assistant understands what is important to the person s/he is dealing with, what makes them “tick,” the easier it will be to achieve desired results in the fastest, easiest way. Adaptability to another’s style is a key to healthy working relationships and is discussed in this in module. Do you know the skills and expertise of the people on your team? If not, you need to know. This is what effective leaders do even when they are in support positions. There is too much at stake in our workplace not to be fully utilizing the unique specialties of everyone on your team. After all, everyone was hired for an important reason. The question becomes, is it common knowledge what those reasons are, if not it needs to be. What do you do really well? That is one of the most powerful questions to ask all the members of your team. We hear so much about thinking “outside the box.” Ultimate assistants ask “what box?” In today’s non-stop workplace, we not only need Plans A & B, but C and sometimes even D because, well, you just never know. So many details, so many moving parts, and so many things that can go wrong are all part of the job description of today’s assistants. In a highly interactive session, students learn how to navigate the bumpy road that the most demanding employers travel on. After all, it’s not if, but when problems arise. Ultimate assistants are ready for anything and equipped to take initiative in finding solutions. The box is no more.This sessions utilizes actual case studies. In the current workplace, administrative professionals are set up for success with a clear and specific Career Development Plan (CDP) that is initiated upon hiring. The CPD will include a Skills Assessment resulting in an understanding of thetraining needs for each individual. This session is designed to explore the professional development options that exist to meet the learning goals of a student’s current and future role. In an interactive module, students will design a plan for their career through the creation of an outline, a timetable, and an Action Plan. Everyone seems to want to work with a mentor but yet, very few assistants have one. Ultimate assistants know that the secret is to actually have more than one. The best way to find a mentor is to be one! In this session, students will explore what being a mentor really means and every student will leave the room with at least one mentor. In a workplace changing at warp speed, mentors can be game-changers for ambitious assistants who aspire to excel at the highest levels. SEEKING EXCELLENCE THROUGH RESOURCES, APPS, WEBSITES, SHORT-CUTS, VENDORS AND MORE! Getting precisely what the assistants and their managers need when needed it is a challenge. An assistant is only as good as her/his resources. What’s on their A-list of go-to resources, apps, websites, vendors, experts, etc.? In this module, we all open our electronic black books and invite everyone to have access. The result is a best-of-the-best list of resources. – Prizes for the best short-cuts! In general, women are socialized as young girls to be competitive with one another and to see one another as adversaries, not collaborators. This training is hard to break, but break them we must because the landscape has changed. There are now more women than men in the workplace and more women than men earning college degrees. The number of women in leadership positions in companies and governments is growing –slowly, but growing nonetheless. Women working together will be instrumental in accelerating the process. After all, the data clearly shows that women are excellent leaders and diverse management means stronger, healthier organizations. The modern workplace requires a new way for women to work with one another and with men because it is not only the right thing to do, it is smart business. We need to do it for women and men, and for our daughters and our sons. Our workplace is in flux, especially for women. Women working for female executives –men working for female managers –men working for male directors –women working for male supervisors. Female admins are being increasingly viewed as a vital part of the management team. They are going back to college for certification and two-and four-year degrees in order to qualify for management positions –and it is working. It is no surprise then that this changing landscape has caused us to alter how we relate to one another –as peers and with managers and executive team. Challenges abound –job title confusion, technology upgrades, virtual offices, globalization, 24/7 access. The good news is that times of change are also times of opportunity –and there is no better time to be a female professional than today. So the time is now to make a difference! More good news is that no one is better at solving problems than administrative professionals. This conference will explore ideas about utilizing the same skills and talents that can be used with the employer, as well as directly for the assistant and with their colleagues. They will learn ways to navigate the changing landscape and work even better with their female and male colleagues. Never one to duck away from a controversial subject, Bonnie shines a light on an epidemic problem that affects 7 out of 10 offices and over 65% of assistants at least once in their careers.If you have ever witnessed or experienced bullying, you know that it takes many forms –from the “Devil Wears Prada” irrational diva, to the co-worker who intentionally withholds important information to the manager who applies rules to certain people and not to others. All of it these bullying behaviors are toxic to a happy, healthy, and profitable workplace. As someone who has first-hand experience with bullying, Bonnie has been researching this subject for years and has connected with some of the world’s experts on the subject. She focuses on proactive and realistic solutions that assistants are implementing that are slowing down the revolving door of staff. Together, we will break the silence and eat theelephant…one bite at a time. Supplemental Resource Book: Taming the Abrasive Manager by Dr. Laura Crawshaw. 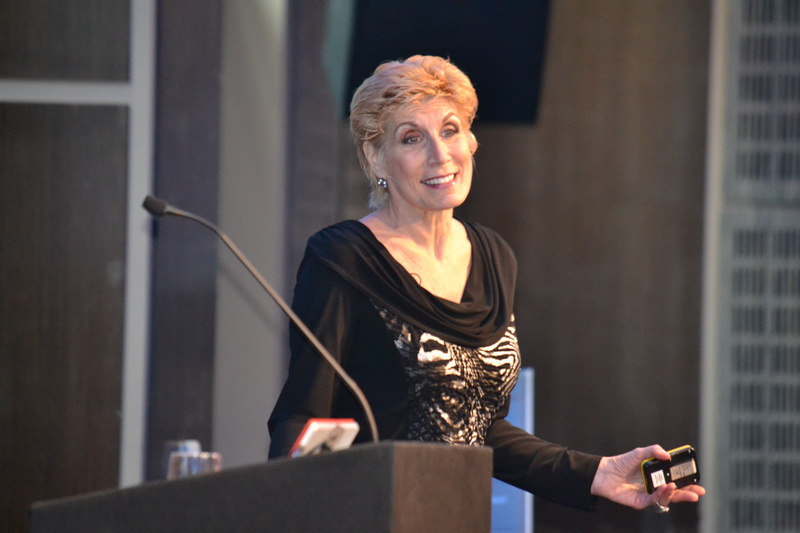 Thank you for providing our 100 administrative professionals with an empowering and inspiring inaugural workshop. The feedback to our leadership teams has been tremendous! Our administrative partners are energized and highly motivated to utilize what they are learning to the benefit of all of the departments they support. We are beginning to see the positive effects on a daily basis, and this workshop has helped us launch our program to enhance the career experience for this very essential part of our organization. I continue to connect with others from the training. It is 3 years later and it is so great to have this network and support each other. I love the work you and Vickie do. Thank you! Thank you! My executive and the team are pleased with my work and what I add to the team. I received a 15% raise today! It was a pleasant surprise. I’ve never, ever received such a large pay increase in my career. Also, I was asked to be on the board of the Admin Awards and be one of the judges! It’s been a red letter day! Thank you for all you do to inspire me. I am excited and will look for even more ways to up my game. If you walk into the office on the following Monday with a bounce, a sense of self, a bit more confidence, ready to take on the world, the training has more than paid for itself. All of this is what brings me back each time. For more information, a quote or to book Bonnie Low-Kramen, please use the contact form or the contact information below.